Environment and climate experts say climate change in Cameroon is already having an impact in coffee production. Heavy rainfall, leading to floods, erosion and landslide has led to a drop in production of coffee in the country experts say. 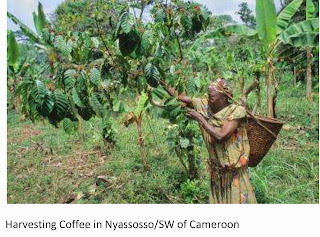 “Extreme weather conditions that have continued to increase in both frequency and intensity, affecting rainfall patterns and disrupting agricultural practices have reduced not only the amount of soil and land suitable for coffee production but distorted the condition for quality coffee production,” says Charlie Ntonifor of the Center for Environment and Rural Transformation, an NGO on environment protection in Cameroon. He was speaking on the sidelines of the third edition of coffee festival in Yaounde on April 24, 2015 dubbed, festicoffee. Coffee farmers in the West region like Thomas Njounkeng 46, attest that excessive rains experienced in the region has hurt both quantity and quality of their product. ''The rains have been lasting for too long reducing production output and quality. I could only harvest 10 bags of coffee last year down fron over 22 bags in previous years. With prolonged rains the coffee seeds get soggy and dampish after harvest, affecting quality. This is a big worry,'' Thomas laments. According to official statistics from the National Cocoa and Coffee Office (NCCB), coffee production plummeted by 56.78% in the 2012-2013 season. At the 2014- 2015 coffee season’s launch held on January 24, 2015 in Mélong in the Littoral region, it was revealed that Cameroon coffee producers only harvested 16,142 tonnes from the previous crop compared to 38,127 tonnes a year earlier. The slump in coffee production, which has been described by the NCCB Executive Board Chairman, Appolinaire Ngwe as “drastic”, followed the same trend as exports and processing. And though the government plans on increasing production as part of its long-term development and poverty-eradication strategy, as well as developing processing and distribution, the impact of climate change may very well thwart these objectives if adequate care is not taken, says agriculture experts. ‘’Climate variability may affect crop yield variability where variations in temperature, precipitation or their interaction may either increase or decrease yields. So it is important for the government to take climate change challenges seriously,’’ says Biyiha Loius Marie, agric engineer at the Ministry of agricultrure. The drop in coffee production has not only hurt local farmers with dwindling income but also the wider Cameroon economy. Throughout the West region where coffee production is highest in the country and where more than 50,000 households depend on coffee production for their income according to government statistics, there are fears many farmers may abandon the production of the crop for other more yielding ones if immediate measures are not taken by the government and other stakeholders to salvage the situation. ‘’Many farmers may abandon the production of coffee if the yields continue to drop. So the government is bound to take some measures,’’ Biyiha Loius said. At the national level, there are fears that the life of more than 2 million people employed either directly or indirectly through the coffee industry that contributed close to US $400 million to the national economy will be threatened by the production decline says CERUT officials. Coffee control and marketing officials however remain optimistic. “Many people don’t realize this, but Cameroon has one of the highest coffee production potential in Africa," says Omer Gatien Malédy, the Executive Secretary to the Inter-professional Cocoa and Coffee Council (CICC) an organization working to protect the interest of local farmers from across the country. He says efforts were afoot to encourage farmers and reverse the trend. And though the government plans on increasing production as part of its long-term development and poverty-eradication strategy, as well as developing processing and distribution, the impact of climate change may very well thwart these objectives, says Environment experts. In the West region of Cameroon where coffee production is still high CERUT has provided guidance to the government on how to better prepare communities by bolstering irrigation systems, developing and planting stress resistant crops, and improving seed and food storage, among other measures. Farmers have appreciated the efforts by civil society organizations to join government combine indigenous knowledge with modern techniques. By talking to farmers, the project is also drawing out local knowledge to understand how past generations dealt with periods of uncertainty. Trade minister Luc Magloire Mbarga Atangana said the government is moving to boost production, processing and domestic consumption. The arabica season runs from 1 October to 30 September while the robusta season is from 1 December to 30 November.